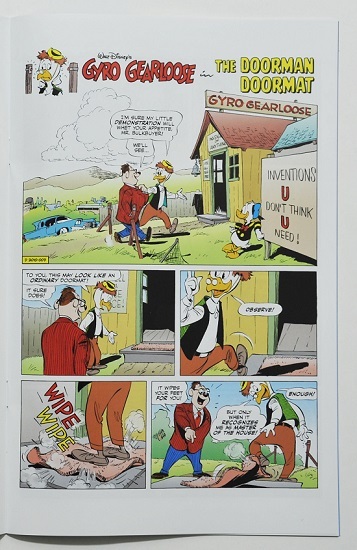 For some reason my local comic shop haven’t received Donald Duck #8 (375) yet. So while I’m waiting, here are some comments on last week’s Disney comics from IDW. Another story (I’ve read a few) with Pandora’s Box, that in Greek mythology actually is a jar... 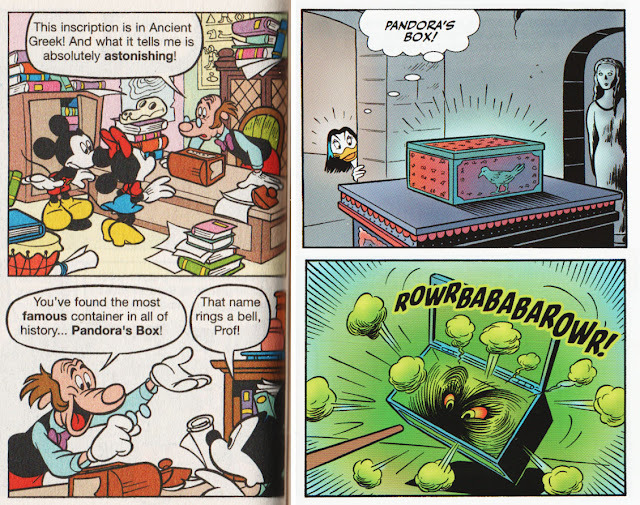 In Boxful of Troubles in Gemstone’s Mickey Mouse Adventures #4, Minnie finds the box at a local flea market. 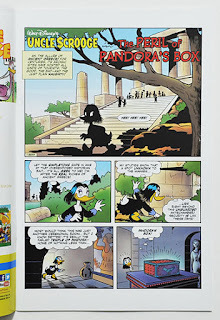 In this story Magica finds the secret entrance to the Temple of Pandora with the box inside. And what is she going to do with it? Well, it’s going to help her steal Scrooge’s number one dime of course! The general plot is not that original, it’s just another story with Magica trying to steal the dime. But what is a bit different, and what I liked about this story is that instead of running after Magica trying to fight her off, the ducks make a clever plot to trick her and get the dime back. And it’s actually the usually short-tempered Donald Duck that suggests this strategy! Also I like Magica as a character, so I enjoyed reading this story. A one-pager with the Beagle Boys in prison. In my last blogpost I asked about the expression "Jumpin’ Jacksnipes". Here we have "Jumpin’ Jailbirds". Are those just some silly expressions made up, or do people really say that in real life? There are two things to be noted in this print of the story. First, IDW again use "Grandpa Blackheart" for the Italian looking grandpa, so it seems they are trying to establish that as his name. I wrote another blogpost just about that two months ago. When the Carl Barks estate was auctioned off, several unfinished scripts and plot ideas were sold. I believe that’s the origin of the plot idea for this story. 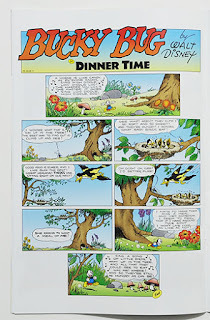 According to Peter Kylling’s great webpage about everything Barks, the very basic idea for this story was written on the back of a Nursery invoice. And it seems it ended up in Daan Jippes’ hands and he developed it into a complete story. Daan Jippes also did another story, "Outcunning the Canines" based on a basic plot idea by Barks, that haven’t been published in the USA yet. 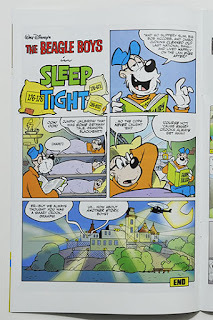 And John Lustig also wrote several stories based on unfinished Barks scripts that were drawn by Daan Jippes. We got one of those in last month’s issue of Walt Disney’s Comics and Stories, and you can read more about it on Lustig’s own blog. I’m sure more of these will be published by IDW next year. If the Magica story wasn’t that original, this one certainly is! 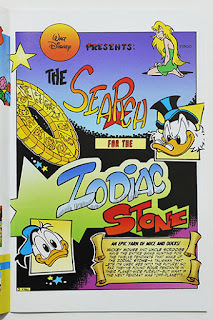 Donald is trying to give out free samples of a men’s magazine no one wants, while Uncle Scrooge has his own problems with obsolete currencies and diamond mines in the middle of a mustache war (!) I don’t think I need to say more, it’s a crazy and fun story. I don’t read these stories actually – I’m waiting for all parts to be published first, and might do a post about it then. 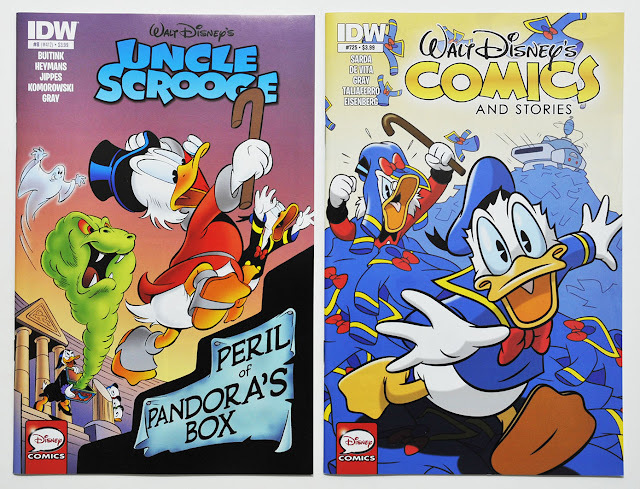 The IDW titles Uncle Scrooge, Donald Duck and Mickey Mouse all get collected in trade paperbacks with 3 comics collected in each. And next year they are also going to be collected in hardcovers with 6 comics collected in each book. 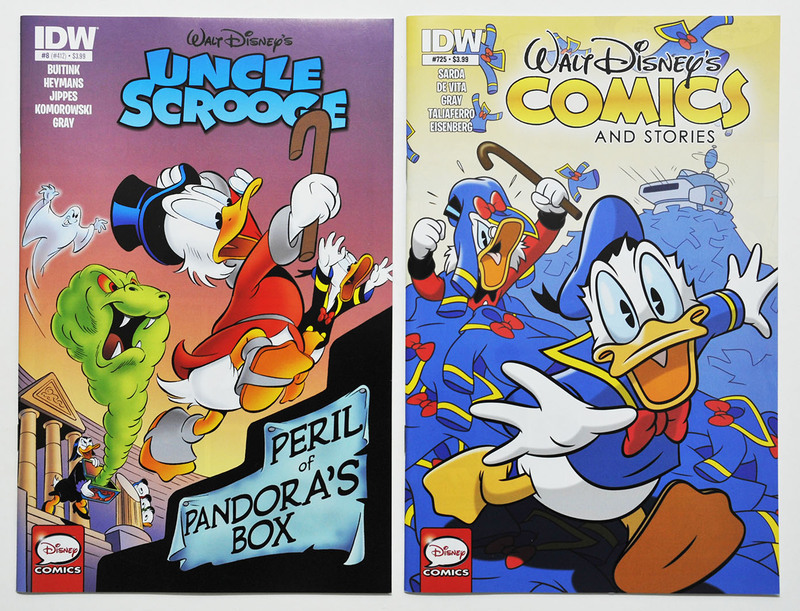 But the first WDC trade, or "Donald and Mickey The Walt Disney’s Comics and Stories 75th Anniversary Collection" (puh..!) that it’s actually titled, is not going to be collecting the monthly titles this way. 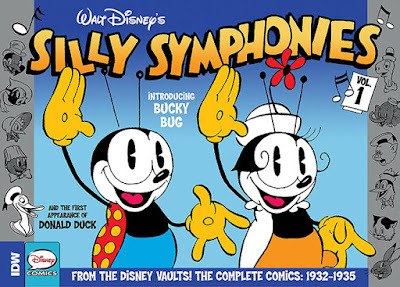 Instead it collects the Anniversary special and the supporting short stories in Walt Disney’s Comics and Stories. 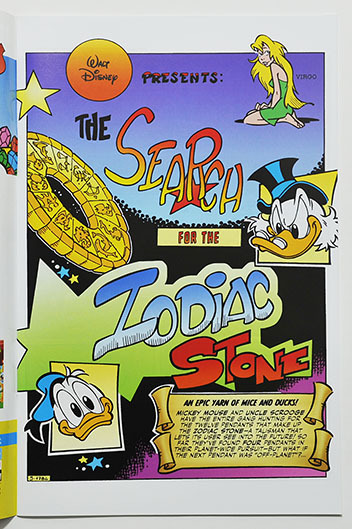 But not the "Search for the Zodiac Stone" story. So this story is probably going to get its own series of trade paperbacks later, or hopefully collected in one single publication. I don’t think I’m going to get these though, as I already have two different Norwegian prints of the story and also get the monthly IDW titles. But I’d rather have the entire storyline in one book than divided into several trade paperbacks. I have to admit I’ve never cared much about the Bucky Bug stories. I don’t have a special reason why, I’ve just never found them funny or that interesting. 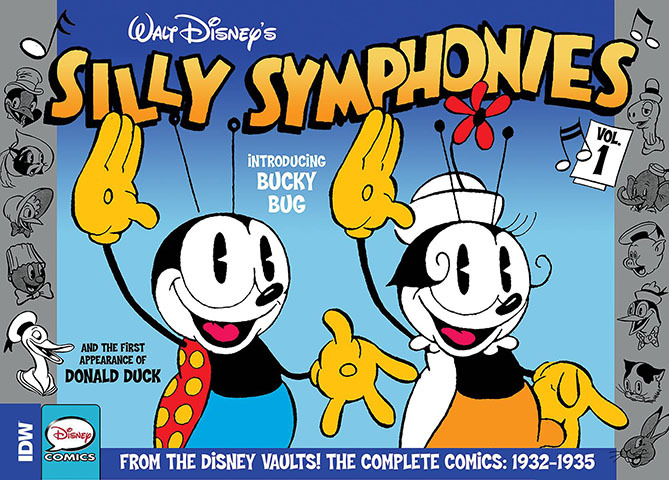 This might change when I get the first volume of the Silly Symphonies collection, which is scheduled for release March next year. I’m really looking forward to that collection! I believe all the Bucky Bug Sunday pages are going to be collected in the first volume, so this one-pager is a little teaser for what’s coming. 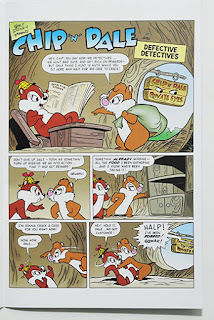 The most interesting thing about this old Chip and Dale story is the coloring. The original coloring had a white hen stumbling into the chipmunk’s home. 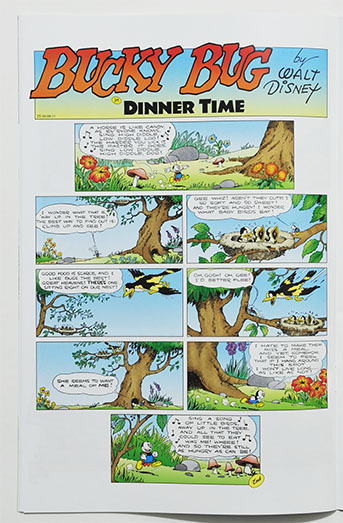 But in the IDW print the hen is clearly colored to be the Wise Little Hen from the cartoon with the same name (and Donald’s debut). I wonder if that’s who Harvey Eisenberg originally intended to draw. 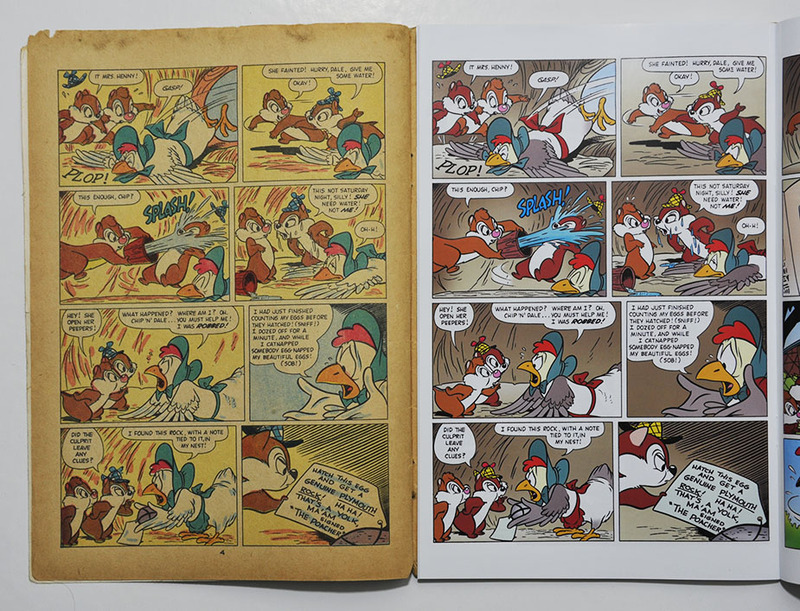 The cartoon to the left, and IDW's coloring of Defective Detectives to the right. 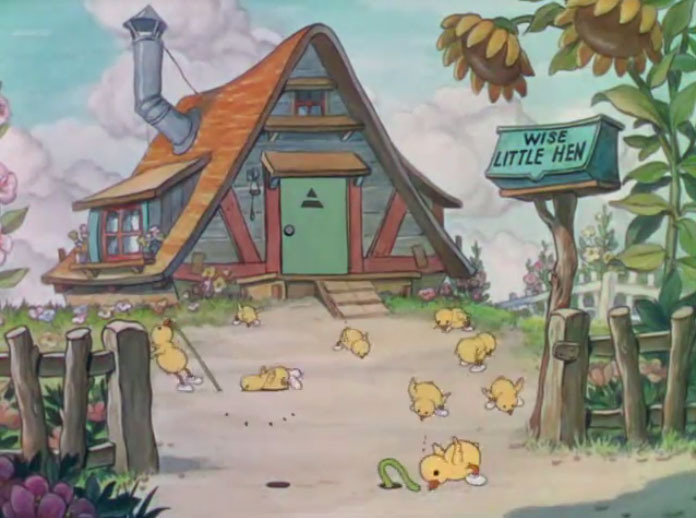 In the cartoon the hen have the name Wise Little Hen on her mailbox, while in the Sunday page adaptation she is simply called Mrs. Hen. In this story however, Chip call her Mrs. Henny. I'm sorry if the layout for this post get messed up in your browser. I gave up trying to adjust it properly using the blogspot editor..
Great post! I hope you do more like this, and not leave me to be the only one to review these comics in detail. Expressions like "Jumpin’ Jacksnipes" and "Jumpin’ Jailbirds" are mere comic strip/ comic book expressions of exclamation. Like Little Orphan Annie’s classic “Leapin’ Lizards!”, which I actually paraphrased in UNCLE SCROOGE # 7 – look for it. No one says them in “real life”, just as no one has ever uttered “Howlin’ Crashwagons” outside of a Disney comic book. It’s just a fun writing convention. Grampa Blackheart will be back in UNCLE SCROOGE # 11. Really nice observation on “The Wise Little Hen” in the Chip ‘n’ Dale story! I did not notice that. And, we can always stand to see more of Harvey Eisenberg, even if Chip ‘n’ Dale were not necessarily his signature characters. 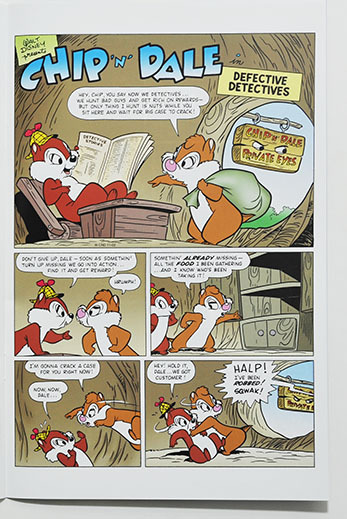 As far as I'm concerned, Chip 'n' Dale are the closest thing to Eisenberg signature characters within the Disney comics universe—and I'd rather see them drawn by him than by almost anyone else. Re: Wise Little Hen, Eisenberg had drawn the actual WLH before (in SILLY SYMPHONIES #1)—and in that story, apart from her shawl, she actually looks less like her original self than she does in "Defective Detectives"! So I'm willing to bet he was interested enough in the character to recreate her for the Chip 'n' Dale story—and that's why, as editor, I asked that she be colored appropriately. Just wondering... I know Harvey Eisenberg drew some Mickey stories early in his career, are they any good? While I clearly enjoy Harvey Eisenberg’s Chip ‘n’ Dale stories, his true "Signature Characters" were Tom and Jerry, The Flintstones, Huckleberry Hound, and Yogi Bear. …And (Tom and Jerry excepted) NO ONE, at any time and in any place, drew those Hanna-Barbera characters better than Harvey Eisenberg – even in their original animated cartoons. Your “Wise Little Hen-tervention” (pardon!) is just one more reason I would want no one else guiding these comics! 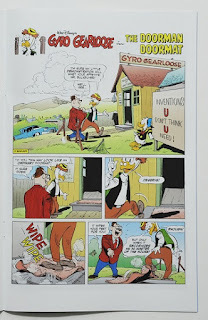 Clapton: Those early Mickey’s may not stack up to Gottfredson at his best (what does? ), but there is no such thing as a bad Harvey Eisenberg story! Awww… Reviews are more interesting overall than just the “nitpicking details” with nothing more, and you could always work the “nitpicking details” INTO the reviews – giving them greater context. So, consider that a vote for reviews! Look at the higher comment-count for this review post, as additional indication. Or my comment-counts on my own review posts. And, I have no doubt David will keep “keep digging up interesting stories”! "There are two things to be noted in this print of the story. First, IDW again use "Grandpa Blackheart" for the Italian looking grandpa, so it seems they are trying to establish that as his name. I wrote another blogpost just about that two months ago. The other thing is that he’s not that "Italian looking" in this print, because IDW has removed his pipe! 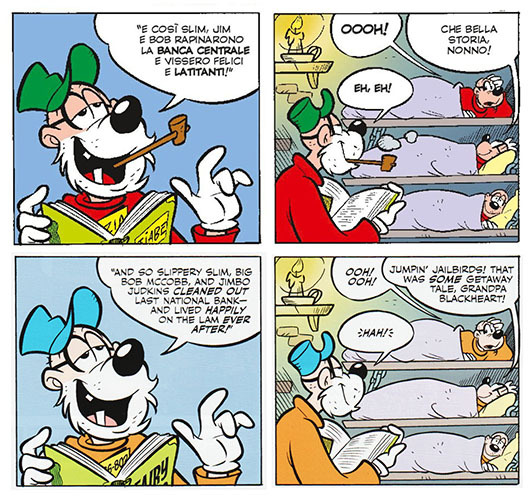 They didn’t find it necessary to do that in Uncle Scrooge #6…"
Another thing to notice is that, just like in Uncle Scrooge #6, Grandpa's prison sign has been changed from "GRAZIA" (Italian word meaning "pardon") to 186-802, so it seems obvious that IDW is trying to establish this as Grandpa's prison number (186-802 is the number Grandpa has in Barks' "The Money Well", in Don Rosa's stories, in Blum's /Mota's "Dime and Dime Again" and in the recent videogame "The Duckforce Rises"). 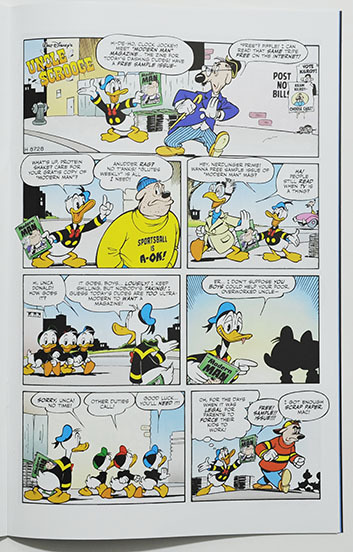 They did the same change in "The Bigger Operator" (Uncle Scrooge #6), but in this 1-pager is not that evident because in both versions there is a book that covers most of the sign/number. 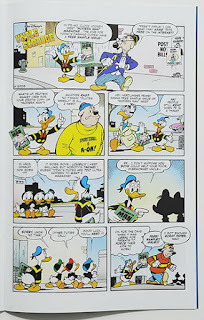 If the character appears again in Uncle Scrooge #11 as Joe Torcivia said, I am curious to see if this trend continues. I am also curious to see if the pipe will be erased or not this time.